Mezcal is a drink like no other. “El elíxir de los dioses” (the elixir of the gods) is a potent and largely handcrafted libation that has been consumed at quinceañeras, weddings and funerals for generations in Oaxaca. Maguey, or the agave plant used to make mezcal, can take seven to 30 years to mature. There are roughly 30 different species used to make mezcal in Oaxaca, each with a distinct flavor: tobalá, which takes an average 15 years to grow, has a smooth, fruity taste, while tepeztate, which matures in about 25 years, is strong and earthy; you can really taste the plant. 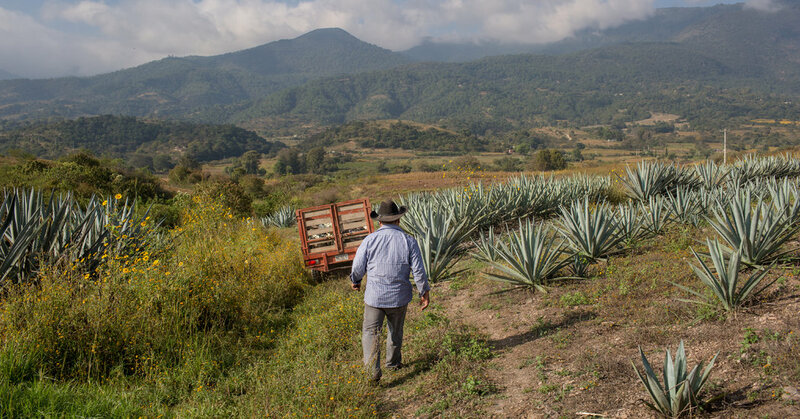 When a maguey plant is harvested, its sugar-rich base, the piña, is dug out of the ground; this “pineapple” is the key to mezcal. The piñas will be covered with rocks in an embers-lined pit and roasted for hours, giving mezcal its famously smoky taste. They are crushed and fermented; the mixture is then distilled several times over wood-burning ovens, yielding a spirit that is rated between 35 and 90 percent alcohol. I find that between 45 and 50 percent is the sweet spot. Much of my work in Mexico has focused on campesinos in the mountains, who struggle against poverty and drug violence. But the story of mezcal is a positive one, about the opportunity for farmers to be autonomous. While shooting for this article, I slept on cement floors in a storage room, rode in the back of pickup trucks through blistering sun, hiked through rugged sierras near unmarked ancient Zapotec ruins and drank magical, handcrafted mezcal under the stars.